Where Roots And Wings Entwine: Win Jack the Giant Slayer on Blu-ray. 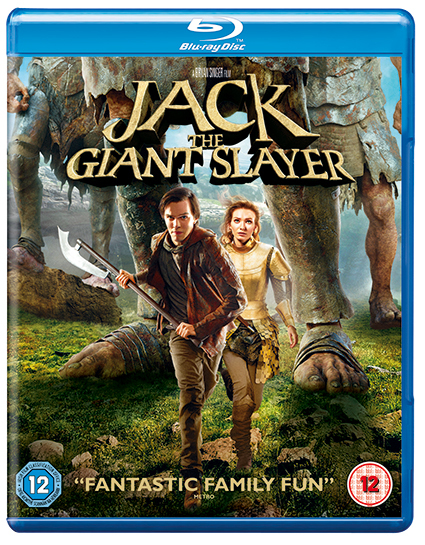 Win Jack the Giant Slayer on Blu-ray. To celebrate the release of Jack the Giant Slayer on DVD and Blu-ray Warner Bros are giving my readers the chance to win a copy of Jack the Giant Slayer on Blu-ray. Jack the Giant Slayer is directed by Brian Singer (X-Men, Superman Returns) and stars Nicholas Hoult (About a Boy), Ewan McGregor (Moulin Rouge! ), and Stanley Tucci (The Lovely Bones). I took the quiz earlier and I'm a Courageous Warrior….what will you be? 1 x Jack the Giant Slayer Blu-ray. i'm courageous :) oh and the film is fun too. I am a courageous warrior - yeah!!!!!!!! I was the fearless knight / king, but to be honest... I didn't chase the dog, refused to climb the beanstalk and waited for an elevator to be built... still, enjoyed it :) - Being brave in my life is living everyday to the best of my ability. I was brave when I donated blood. I was very, very brave when I had to have a piece of glass taken out of my foot, it hurt like hell. Ouch, I had a nail in my foot once and that hurt like hell so I feel your pain. I was brave when I became diabetic and I was needlephobic and I had to learn to inject myself. Bless you, I had gestational diabetes and it was bad enough having to test my blood with the prick tests, I can't imagine what it would have to be like to inject yourself. I am a courageous warrior too! Phew! Courageous warrior. I was a bit worried there for a moment because I'm scared of heights and the idea of climbing anything makes me tremble! Lol bless you.....well done on conquering your fear of heights! I was brave when I was in my teenage years I was wearing flip flops on my feet and stood on a 2" nail sticking out of the ground, it went straight through my flip flop into my foot it was very painful, I had to go to the hospital with it still there OUCH! I can feel your pain I stood on a nail a few years ago that went straight through my flip flops into my foot, Ouch! Good on you, moving to a new area can be scary enough as it is let alone when you do not know anyone. Courageous Warrior - note to self, remember this next time you have to tackle a customer services dept. I 'Live To Fight Another Day'! I was brave when I was admitted to hospital 2 weeks ago! COURAGEOUS WARRIOR!YOU’RE SO BRAVE THAT FEAR IS AFRAID OF YOU! BEARS COWER AND LIONS TREMBLE WHEN YOU’RE IN THEIR MIDST. KEEP BEING COURAGEOUS AND CONTINUE TO USE YOUR POWERS TO HELP THOSE IN NEED. JACK WOULD INSTANTLY AGREE THAT THE WORLD NEEDS MORE WARRIORS LIKE YOU. I was brave when my daughetr had her skin cell test, she was very brave too!! Well done to you both. Its horrible having to see your little ones have tests. I am a courageous warrior apparently! I am a courageous Warrior and apparently Lions fear me LOL! I held a Tarantula last year and have a photo to prove it! I still cannot handle english house spiders though as recent days have proved!! I felt brave the other day when I had my first wasp sting.. it managed to fly UP my dress.. ouch! Didn't cry though! Lion-hearted knight aka total wimp! Bless you, I bet put on the spot you would surprise yourself. I feel brave going to the dentist!! A trip to the dentist can be nerve-racking.